The Global Volcanism Program has no activity reports for Zukur. The Global Volcanism Program has no Weekly Reports available for Zukur. The Global Volcanism Program has no Bulletin Reports available for Zukur. Zukur (Zugar), the northernmost large island of the Zukur-Hanish island group in the southern Red Sea, is formed of Holocene basaltic pyroclastic cones and spatter cones that issued youthful-looking pahoehoe lava flows. This island group lies in shallow waters S of the Red Sea median trough. Products of phreatic eruptions form small islands and coastal cones. Late-stage trachytic lava domes produced viscous lava flows. Vents on Zukur are aligned along a NE-SW trend. The Global Volcanism Program is not aware of any Holocene eruptions from Zukur. If this volcano has had large eruptions (VEI >= 4) prior to 10,000 years ago, information might be found on the Zukur page in the LaMEVE (Large Magnitude Explosive Volcanic Eruptions) database, a part of the Volcano Global Risk Identification and Analysis Project (VOGRIPA). There is no Deformation History data available for Zukur. There is no Emissions History data available for Zukur. Zukur (Zugar), the northernmost large island of the Zukur-Hanish island group in the southern Red Sea, is seen in this NASA Landsat image (with north to the top). Numerous young basaltic pyroclastic cones and spatter cones were the source of pahoehoe lava flows. Products of phreatic eruptions at Zukur form small islands, such as Shark and Near Islands off the SW coast of Zukur. 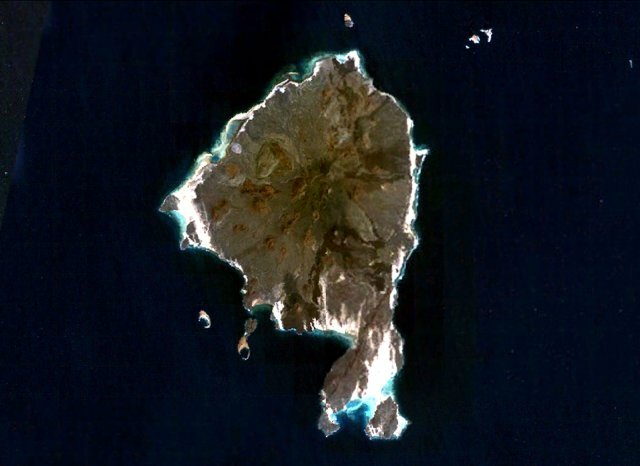 Vents on Zukur are aligned along a NE-SW trend, as seen on the peninsula at the southern tip of the island. There are no samples for Zukur in the Smithsonian's NMNH Department of Mineral Sciences Rock and Ore collection. Large Eruptions of Zukur Information about large Quaternary eruptions (VEI >= 4) is cataloged in the Large Magnitude Explosive Volcanic Eruptions (LaMEVE) database of the Volcano Global Risk Identification and Analysis Project (VOGRIPA).